Today I am excited to have Megan from over at Renewing All Things sharing one of her amazingly delicious recipes. I stumbled onto her Facebook page a while back and was really inspire by her simple and practical approach to health. 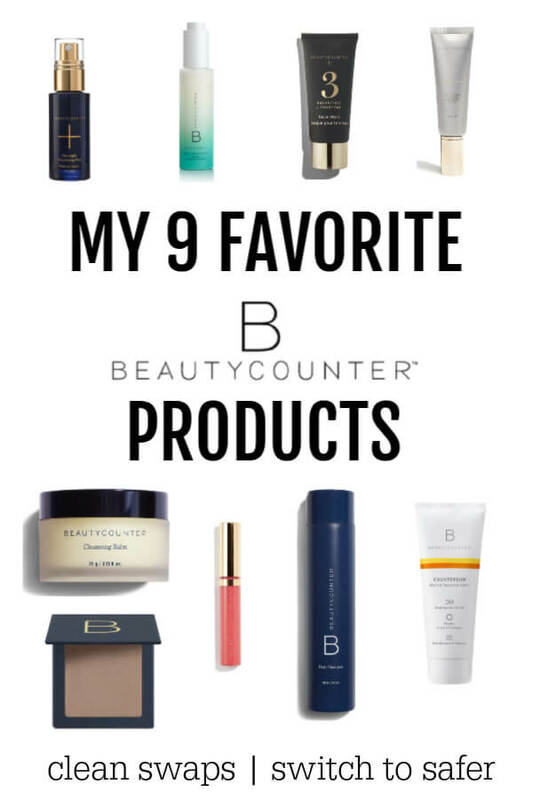 And I love all of her info on natural skincare! Be sure to check her out on Facebook, Twitter, Pinterest , and Instagram as well. Hi, everyone! Megan here from Renewing All Things. Good to be here. 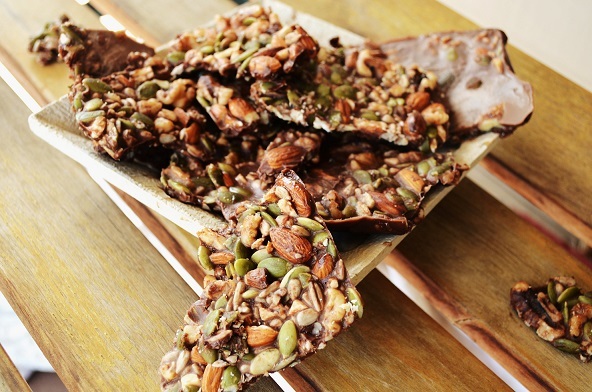 This nut bar is the perfect snack, dessert, or side. Full of metabolism boosting and brain fueling coconut oil, enzyme rich honey, antioxidant rich cacao powder, and nuts and seeds full of minerals, fiber, and protein to fuel your body and support healthy skin. 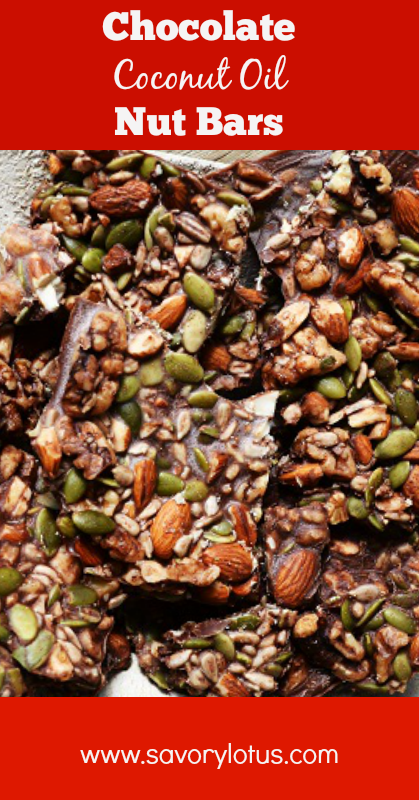 These will satisfy sugar cravings, and take the place of processed protein or candy bars. Add more/less honey depending on how sweet you like it. 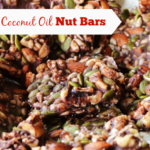 Use any combination of any nuts/seeds you like. You can add less nuts of you want more of a chocolate bar. Add more coconut oil or a tad bit of coconut milk if you need more liquid to fill the size of pan you are using. Pulse nuts in blender until chopped to your liking, some like bigger chunks, some like small. Melt coconut oil, honey, and cacao on low heat and mix until fully combined. Add nuts to chocolate mixture and combine. Line a 9×13 pan with unbleached parchment paper. Add mixture and flatten until spread evenly around pan. Let harden in freezer for 30 minutes. Keep in fridge for remaining time. Megan Kelly is a Licensed Esthetician specializing in holistic nutrition, woman’s hormones, and natural beauty. 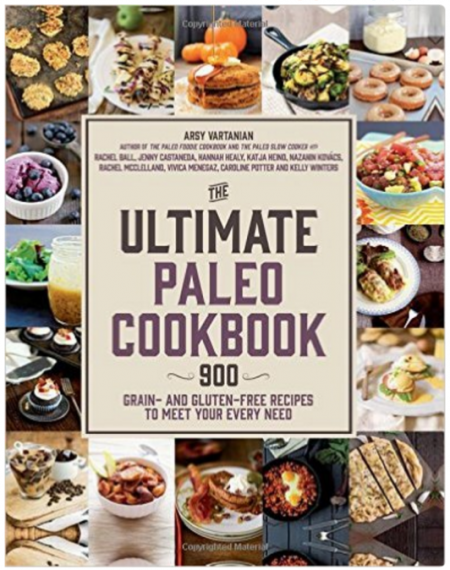 Empowering people to live a life of bliss through nourishing their mind, body, and spirit, she teaches how the food we eat, the thoughts we think, and the toxins we avoid, literally control how our genes express themselves. It is Megan‘s goal to see people restored, experience true health and joy like never before. From the photo, it’s pretty obvious that the nuts weren’t mixed with the chocolate /coconut oil mixture before being spread in the pan. 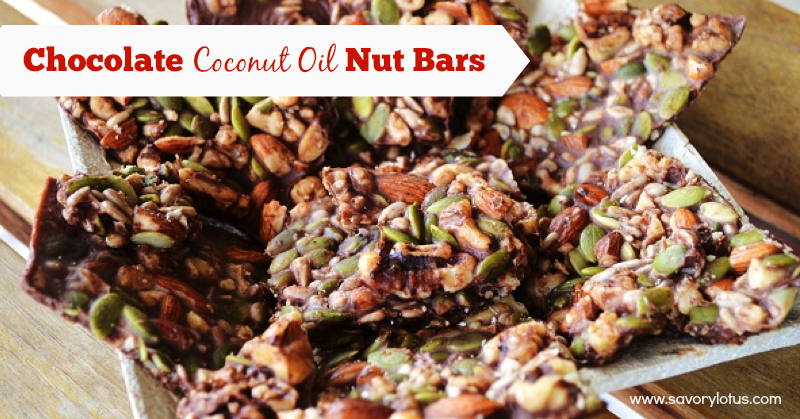 Did you just spread the chocolate/coconut oil mix in the pan and sprinkle the nuts on top? The nuts are actually folded into the mixture before spreading into the pan. You can give the pan a little jiggle to help the nuts rise to the surface a bit more. Thanks for stopping by! Any suggestions On what i Can use to replace The honey? I’m on the Candida diet and honey, maple syrup, and sugar is not allowed…. So I tried out the recipe and love the flavour but I have a problem with the chocolate melting very quickly and turning liquid. Is there anything I can do to stop this? This is very good, thank you. Next time I make this, I’ll increase the recipe by 50% to better fill a 9×13 pan — too thin when fully spread out.